If you were to sell your investment property tomorrow, do you know how much you would owe in taxes? The answer might surprise you. We built a 1031 Exchange Tax Savings Calculator that helps you answer this question. After getting feedback from some trusted investors, we’ve simplified and improved our calculator, so it’s something you can easily do on your own in about 3 minutes… no CPA required. Try out the calculator on any of your devices! 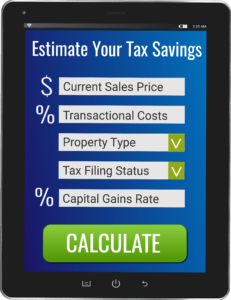 The calculator will show you how much you can save in taxes by doing a 1031 Exchange with your investment property into Guardian Fund. One thing that many people don’t realize is when you sell your property, you have two types of taxes to pay. The first is capital gains taxes, if you have a profit on the sale of your property. The second, lesser-known tax is your Recapture Depreciation Tax. That amount can be a surprising sum, depending on how many years you have held onto the property. This is especially true if you owned the property for a long time and it depreciated significantly. At that point, Recaptured Depreciation Tax is owed, regardless of whether or not you had any capital gains on the sale of the property. Here’s an example: say you bought the property 20 years ago for $200,000. Assuming that 75% of it was depreciated on the 27.5-year schedule, that would equal about $109,000 in depreciation over that 20-year period. The $109,000 would be taxed at 25% therefore leaving you, the seller, owing $27,250 just for the Recaptured Depreciation Tax. There is no way around that unless you do a 1031 Exchange. Version 2.0 of our calculator covers both types of tax and is extremely simple to use. You can enter your information into the calculator in less than 3 minutes. Don’t be intimidated… you will know all of the answers off the top of your head. Keep in mind, these numbers are only an estimate, but it will give you a quick idea of your tax savings and how much more money you could be making if you invested those tax savings. Every dollar you save today adds up to more money in your retirement portfolio in the future — and that can be a significant amount! A savings of $27,250 in taxes invested and compounded at 8% for 10 years turns into $60,485. That is the benefit of doing a 1031 Exchange: more money in your pocket. Don’t be surprised by a big tax bill. There are ways to keep your hard-earned money from going to the IRS! This calculator can help.